An Imperial Oil megaload passes under the highway sign at the split between U.S. Highway 95 and U.S. Highway 12. 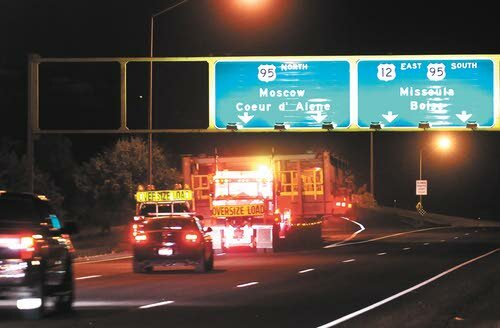 The 24-foot-wide, 14-foot-tall, and 208-foot-long oversized load departed Lewiston Thursday night on its way to Moscow and beyond to Alberta, Canada (The Lewiston Tribune/Kyle Mills photo). Imperial Oil shipment leaves via U.S. Highway 95. The stars in a summer sky were among the only witnesses to the departure of the first Imperial Oil megaload to go through Moscow. The load left the Port of Lewiston at 10:05 p.m. Thursday, following a couple of honks that signaled the start of its journey. 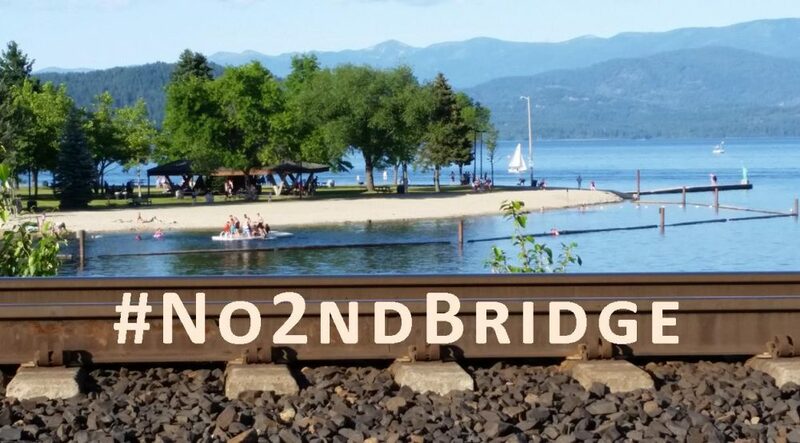 Wild Idaho Rising Tide, an anti-megaload group, had previously announced plans to watch it leave Lewiston and protest it in Moscow. The monitors were heading to Lewiston, said Helen Yost, an organizer with the group in Moscow, who couldn’t confirm they’d arrived. About a dozen people gathered in Moscow by 10 p.m. to oppose the oversized load and at least two dozen more were expected, Yost said. Allowing loads to use north central Idaho’s roads is a bad idea for a variety of reasons, Yost said. The extraction process in the tar sands where the load is headed hurts the ecosystem, Yost said. In doing so, they affect the lives of indigineous Canadians who have a subsistence lifestyle of hunting and fishing, Yost said. Imperial Oil has stated previously the impact of the oversized hauls is similar to that of regular semi tractor-trailers because of how the weight is distributed per axle. Two calls to Imperial Oil late Thursday night were not immediately returned. Idaho State Police (ISP) took no extra security measures. The same four officers that accompanied five previous megaloads that used U.S. Highway 12 earlier in the year went with the rig heading on U.S. Highway 95 to the Palouse, said Captain Lonnie Richardson of ISP. Their overtime is paid for by Imperial Oil. The 24-foot-wide, 14-foot-high, and 208-foot-long rig was carrying a piece of a processing plant to be built at the Kearl Oil Sands in Alberta, Canada. Idaho Transportation Department (ITD) rules require it to pull over every 15 minutes to allow cars to pass, and limit its travel times to between 10 p.m. and 5:30 a.m. It was supposed to get as far at the Latah/Benewah County line by early this morning and then resume traveling after 10 p.m. today to a stopping point 15 miles east of Coeur d’Alene on Interstate 90. On the third segment of its Idaho journey, it was expected to reach the Montana state line. The component that moved Thursday was among 33 that arrived at the Port of Lewiston in the fall and were converted to about 70 shorter hauls at a cost of almost $500,000 each. The work made it possible for them to navigate underneath interstate overpasses. Originally the 33 were part of a group of 207 loads Imperial Oil wanted get across Idaho on U.S. Highway 12. Imperial Oil chose to modify the cargo after it took longer than the oil company anticipated to get permits to move them on U.S. 12. The delays occurred because opponents successfully insisted they get a chance to testify in a formal proceeding before ITD made any final decision on the issue. So far, ITD has granted permission for only one Imperial Oil shipment to take U.S. 12, a test module in the same dimensions and weight as the largest of the proposed shipments. A court case brought by Missoula County commissioners and three environmental groups has, so far, blocked Imperial Oil’s efforts to use U.S. 12 in Montana. In the meantime, Imperial Oil is finding other ways to get the Korean-made components to Canada, bypassing the Port of Lewiston after they arrive at the Port of Vancouver, Washington. Sixty are able to use a mostly interstate route through Washington, Idaho, and Montana without any fabrication. At least 49 more have been staged at the Port of Pasco for a four-lane highway and interstate route through the three states.